Every day in the United States, 30 people die as a result of impaired driving crashes. During 2010, alcohol was a contributing factor in 298 highway fatalities in Georgia, while drugs other than alcohol (e.g., marijuana and cocaine) are involved in about 18% of motor vehicle driver deaths. Driving while impaired, under the influence of alcohol or an illegal substance, continues to pose a serious safety threat all over Georgia. When someone takes to the road after having had too much to drink or ingesting prescription medications and/or illicit drugs, the consequences are often catastrophic, not only for the impaired driver, but for innocent drivers and their passengers caught in the impaired driver’s path. With funding from the Governor’s Office of Highway Safety, GPSTC has developed a rigorous 240-hour Drug Recognition Expert program designed to keep Georgians safe by removing impaired drivers from the roadways. 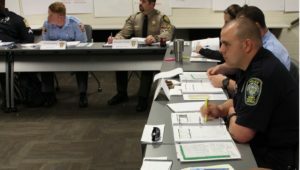 Law enforcement officers who participate in the program become proficient at identifying drugs and drug categories as well as detecting the signs that impaired drivers display when under the influence of drugs. Completion of Drug Recognition Expert School makes officers eligible for testing, which leads to certification as a drug recognition expert through the International Association of Chiefs of Police. Candidates seeking acceptance into the training program are selected based upon their training, experience and a recommendation from their agency. After successfully completing each phase of training, students will earn 160 hours of POST credit and will become eligible to take the Final Knowledge Examination, which consists of a comprehensive written exam consisting of all material covered in the classroom and in the field. Drug Recognition Experts are required to attend an 8-hour re-certification training every two years in order to maintain their certification.